We’re excited to announce the Power BI Desktop October update. This month’s update includes 23 new or improved features. While this is just about half the number of features compared to last month’s update, we expect you will find many of these features exciting and useful to you. Ability to change Font Size. Additional Formatting Options for Gauges. This video will walk you through all of these features in more detail, or you can continue reading the rest of this blog post for a description about each feature. 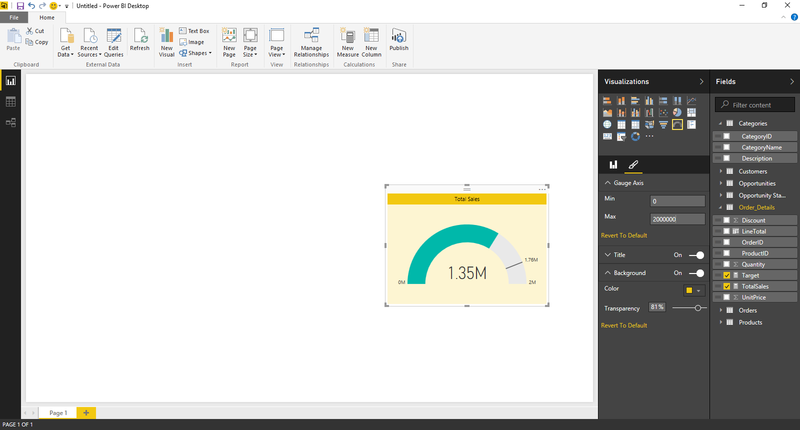 As you may have read in our announcement from earlier this week, we’re bringing to Power BI the ability to use custom visuals. 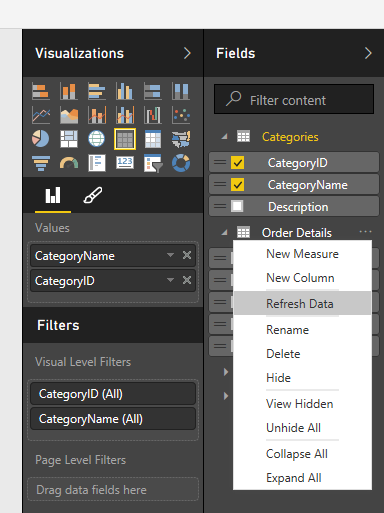 This allows users to leverage visuals tailored for their own needs, whether these visuals were created by them or found in the Power BI Visuals Gallery. Users can now add their custom visuals to Power BI Desktop reports, which can then be shared with other users in the Power BI service. 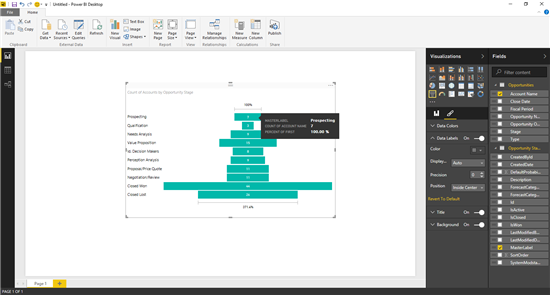 Once included in the reports these new visuals behave exactly like the rest of the “native” visuals of Power BI. You can filter them, cross highlight and control their formatting. 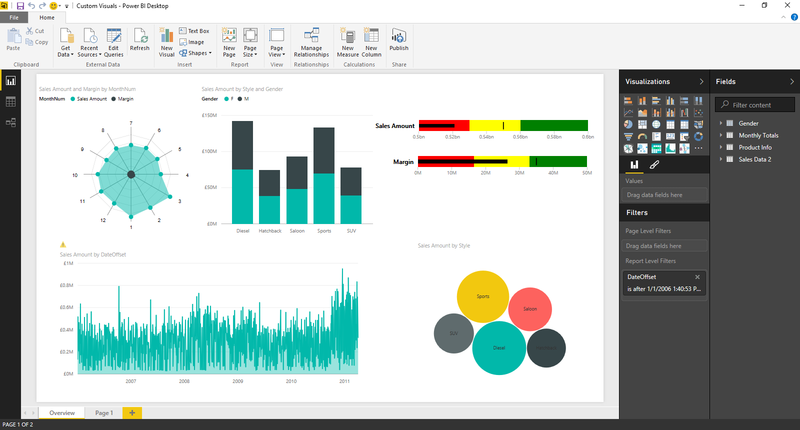 To make it easy to find these exciting new visuals, we are also introducing the Power BI visuals gallery, where you can download community creations with a couple of clicks and incorporate those into your report. Users can now click the “Insert Visual” button from the Home tab in the ribbon of the Report view, to insert a new visual in the current report page. This creates a default visual that users can then reconfigure. We have improved the default sorting behavior for items within a visual. For instance, when displaying a column chart, we will default to sort ascending by the value in the categorical axis, or when sorting by the measure being displayed, we will default to descending sort. Funnel charts now support tooltips when hovering over each funnel stage. These tooltips provide information about the Stage Name, the measure being displayed, as well as % compared to the first and previous stages. In addition to tooltips, we have also added support for customization options on Data Labels for funnel charts. 1. Users can now sort the values in a Slicer control by using the Sort control on the top-right corner of the Slicer. 2. 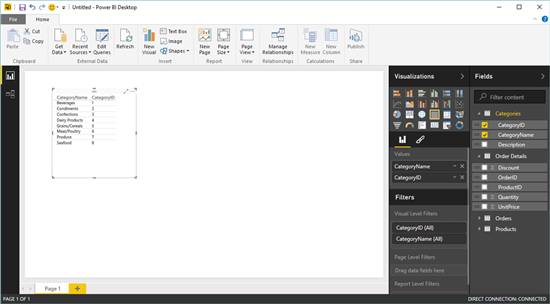 Ability to change font sizes: It is possible to customize the Font Size for slicer items (header and row items), as well as background options, by using the Formatting pane options when the slicer is selected. Several new formatting options have been added to Gauge visualizations, including the ability to set the Min/Max and Target values for the Gauge Axis, Title and Background options. We have optimized the layout of the labels for Data Points within a visual. This prevents labels to overlap when the data points are too close to each other. This is particularly helpful when visualizing column charts with several columns, or when working with line charts. 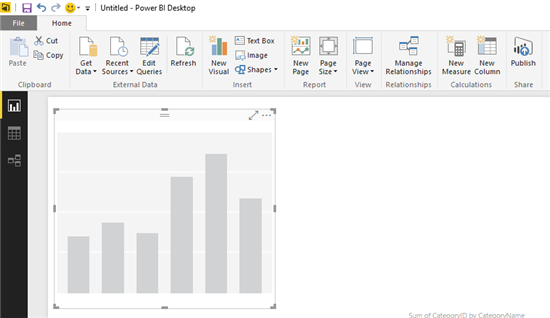 We’re enabling consumption of KPIs when connecting Power BI Desktop to a PowerPivot or Analysis Services model that support them, such as an AS Tabular Model, or when converting an Excel Workbook that contains a KPI in a Power View sheet. Note that this only enables consumption of a KPI within a report, but it doesn’t offer authoring or configuration capabilities for the KPI for now. This feature is available as an early Preview, with the goal of getting valuable feedback to help us improve the feature before enabling it by default. You can enable this feature by going into the Options dialog (File -> Options) and clicking on the “Preview Features” tab under “Global”. After enabling this feature, you will be able to start visualizing KPIs in your Power BI Desktop reports, such as “Sales Growth YoY” in the following screenshot. Watch the following video for more details about this feature. When authoring DAX formulas on the Data view, users can now click on columns within the data preview to insert a reference to them into the formula bar. You can watch this feature in action in the following video. This month we’re pleased to announce availability of a new connector for Azure DocumentDB in Power BI Desktop. Business analysts and information workers can now leverage Power BI to slice and dice data from DocumentDB and create the visualizations desired. 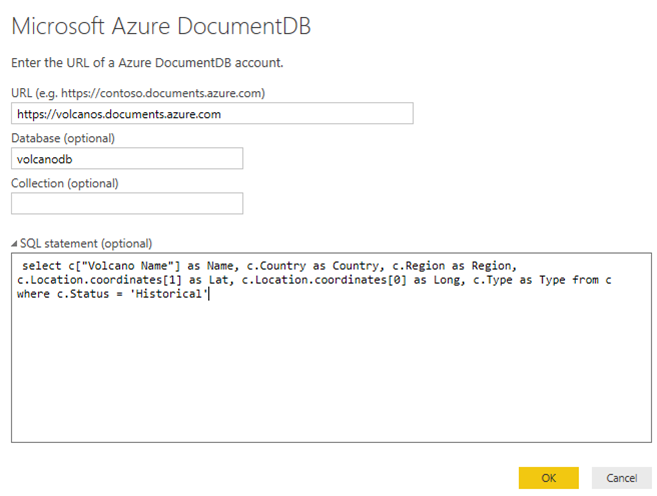 The new Azure DocumentDB connector is available in the “Get Data” dialog, under “Azure”. To connect to a DocumentDB account, all you need is the endpoint URL and the master key. Once connected, you can use the Navigator in Power BI Desktop to explore the data within the account. The connector supports DocumentDB SQL as well. You can use supported DocumentDB SQL query features to retrieve the data you need. All you need to do is to simply provide a Database name, a Collection name and a SQL statement in the connector dialog. 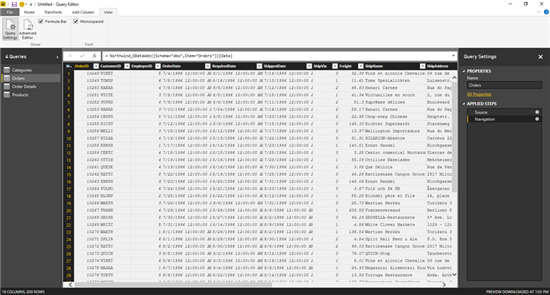 The connector will then query against the specific collection in the database. The connector also supports fan-out queries. Providing a SQL Statement and a Database name without a Collection name will enable the connector to query across all collections within the database. See this connector in the following video. The second new connector this month is a new connector for Mailchimp. This connector allows users to extract data from their Mailchimp accounts to monitor data and trends about their campaigns, reports and individual subscribers. 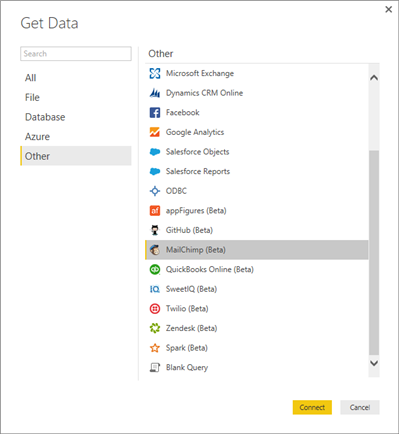 In addition to creating basic Mailchimp dashboards to analyze data, Power BI Desktop users can benefit from the data preparation and mashup capabilities of Power BI Desktop to analyze Mailchimp data in combination with any other data relevant to them, allowing them to create reports to visualize this data. The new Mailchimp connector can be found in the “Get Data” dialog, under the “Other” category. 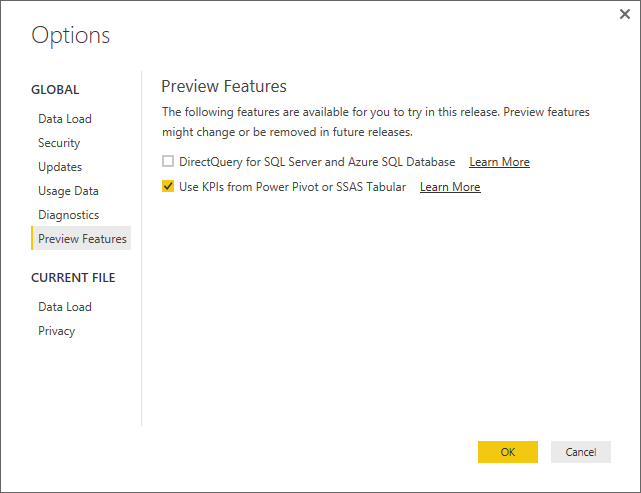 We’re adding a new mode for SQL Server and Azure SQL database sources so that users can pick between loading their data or using DirectQuery. DirectQuery allows users to work against remote data sources and create visualizations without having to import the data to the local data model inside Power BI Desktop. This feature is available as a Preview feature in this update. Users need to enable this feature by going into the Options dialog and browsing to the “Global -> Preview Features” tab. After enabling this feature, users can connect to a SQL Server or Azure SQL Database and select one or multiple items in the Navigator dialog. 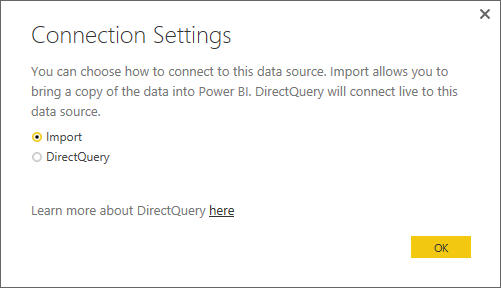 After clicking Load or Edit, users will be presented with the choice to import data or use DirectQuery. When selecting DirectQuery, users will be able to start building reports against the selected tables without having to load the data locally. 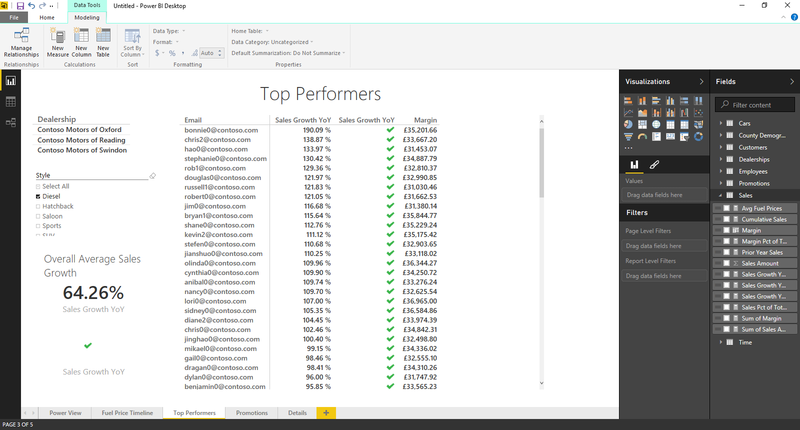 Learn more about DirectQuery by watching this video. We have added a new DateTime columns filter option in the Query Editor, to allow users to filter by dates which are not the earliest or latest dates within the current column. Another new DateTime filter this month is the ability to filter out values that are within the previous N minutes/hours/seconds. This can be accessed via the “In the Previous…” option from the Filter menu for DateTime columns. We know that very often users will work with multiple tools in their daily activities and one of the most frequently used tools for Data Analysts is Excel. 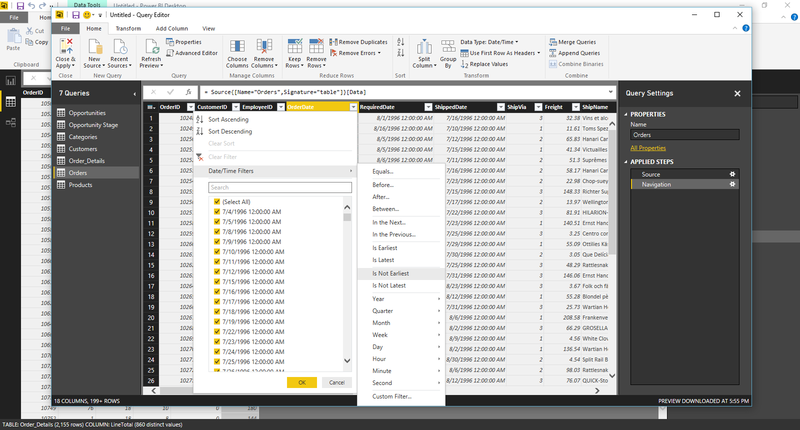 With this update, we’re making it seamless for users to copy/paste their queries between Power BI Desktop and Excel/Power Query, or to copy/paste between multiple Power BI Desktop files. Users can now right-click on a query, a query group or the Queries task pane in the Query Editor in Power BI Desktop to copy those queries. With this update, they can then paste these queries into another Power BI Desktop file. 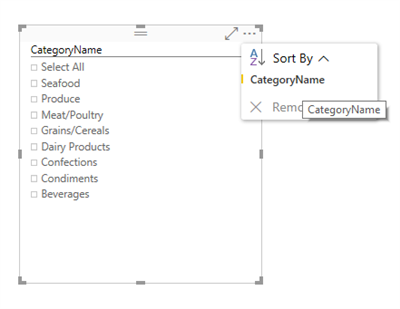 In the next few weeks, a new update for Power Query will allow users to paste their queries also in Excel, or to copy queries from Excel into Power BI Desktop. See this Copy/Paste feature in action by watching the following video. Last month we added support for using Special Characters in the Replace Values dialog, for values to find and replace with. 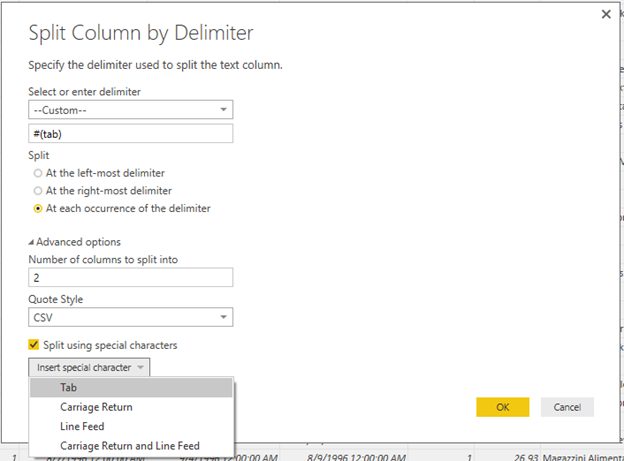 This month, we have enabled the same functionality for Split Column by Delimiter operations. 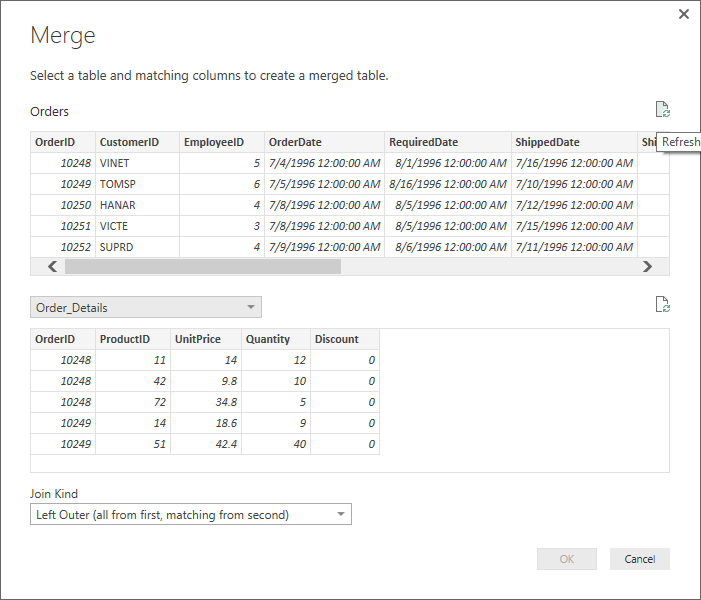 It is now possible to refresh the table previews within the Merge Queries dialog, so that users can select which columns to match using the latest available data. Users can now customize the Query Editor Preview to display content using a monospaced font. This customization option can be found under the View tab. Users can now refresh a single table within the Report & Data views by using the new context menu option for “Refresh Data” available on table items in the Fields pane. This avoids having to wait for all tables to be refreshed and instead refresh just the one that they are interested in at the moment. 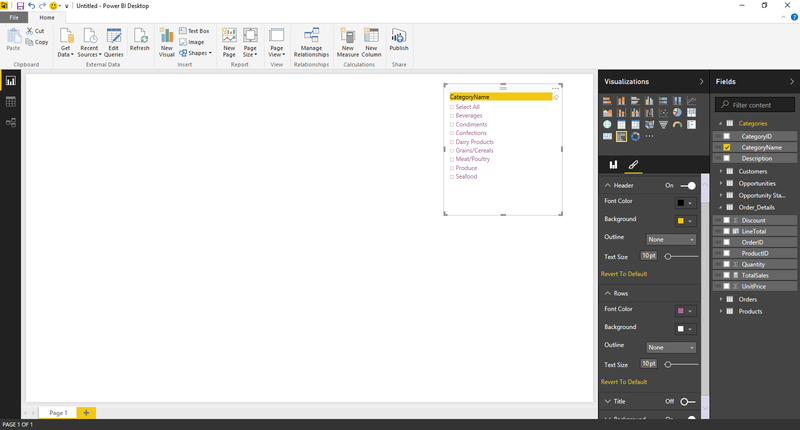 As you have seen with a couple of features in this announcement, we are enabling a channel for users to try out Preview features in Power BI Desktop. The goal behind this feature is that users will be able to share feedback about these Preview features that will help us improve the features before making them available as a mainstream feature in the product. This Preview features dialog can be accessed from the Options dialog (File -> Options), under the “Global” group. 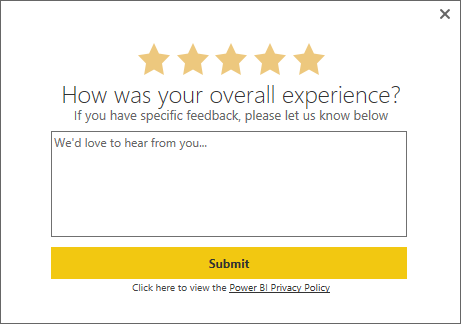 In this update, we’re adding a new way for users to share feedback about their experience with Power BI Desktop. We’ve added a new “Rate Your Experience” option, next to “Send a Smile/Frown” in the Quick Access Toolbar and also under the File menu (“Send Feedback” group). Send a 1-5 stars rating about their overall experience. Optionally include a short comment about their experience. Feedback sent via this new experience is anonymous. No user email address is required for this feedback to be sent to Microsoft. That’s all for this month’s update. We hope that you enjoy these new features and continue sending us feedback about our product. Meld u hieronder aan om het laatste nieuws over Power BI rechtstreeks in uw postvak IN te ontvangen. Door te klikken op 'Registreer u vandaag nog' geeft u Microsoft toestemming om u via het nieuwsbriefprogramma van Power BI te voorzien van exclusief nieuws, enquêtes, tips, advies en andere informatie, zodat u optimaal van Power BI kunt profiteren. U kunt zich op elk moment afmelden. Privacyverklaring van Microsoft. 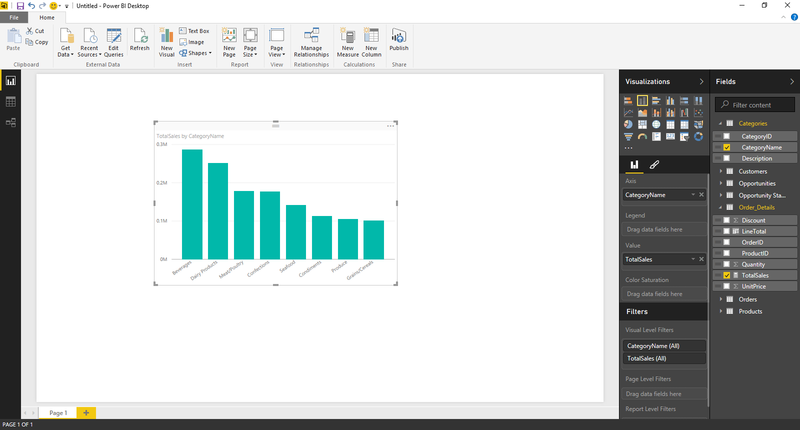 Power BI is een pakket van hulpprogramma's waarmee u bedrijfsgegevens kunt analyseren en inzichten kunt delen. Monitor uw bedrijf en ontvang snel antwoorden via de geavanceerde dashboards die op elk apparaat beschikbaar zijn.